I’m always on the lookout for a new dinner recipe. I pin recipes to Pinterest all the time to my “It’s Dinner Time!” board to save for later. 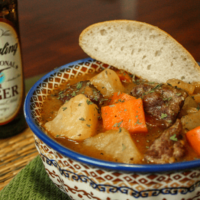 So this week, when it was time to make the menu and grocery list, I decided it was time to add Gimme Some Oven’s Guinness Beef Stew to the mix and turn it in to my Yuengling Beef Stew. We already had some beer in the house… but it wasn’t Guinness. What we did have was a case of my husband’s favorite beer from Pennsylvania, Yuengling. Being out here in Germany, we only get this beef a couple times a year when the stores bring in a couple palates to the Shoppette. I’m pretty certain though that this beer is probably BETTER in this stew than Guinness. I also didn’t have all the spices that the recipe called for, so I used what was in my kitchen. Which seriously you totally can do that too. That’s what I love about recipes like this… they are really so versatile. You can’t mess it up. I served the stew is big bowls with Euro rolls. Hard on the outside, but soft on the inside… slathered with butter. Yum! I hope you make this for your family… it’s sooooooo rich and delicious! 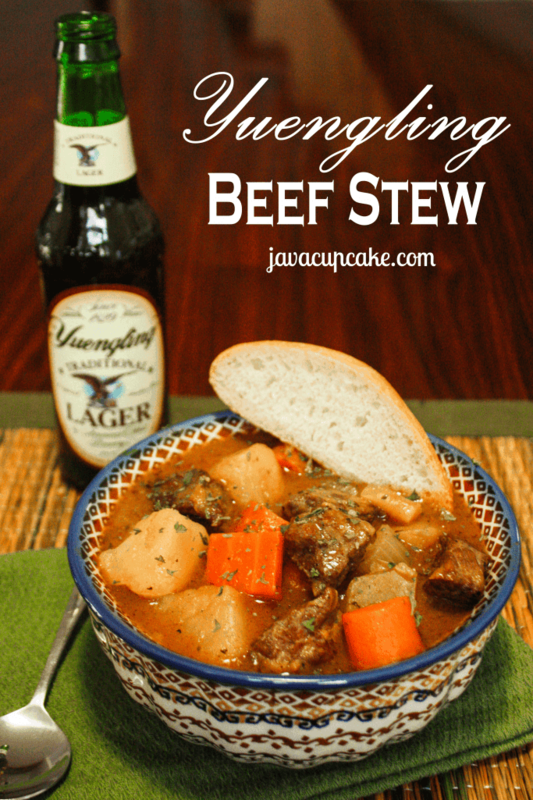 This Yuengling Beef Stew is definitely a winner and a recipe we’ll make again! Trim the chuck roast of all fat and cut into 1 inch cubes. Generously season all sides with salt and pepper the dredge cubes in 1 cup of flour. In a large, heavy sided pot on medium high heat, heat 1-2 Tbsp olive oil. In small batches, shake off extra flour from the meat and place in the hot oil. Cook on all sides until browned... about 4-6 minutes. Remove cooked meat to a bowl and set aside. Once all the meat has been browned, add the onions to the pan and 1-2 Tbsp more olive oil. With a wooden spoon, scrape the bottom of the pan to get up any chunks of goodness. Cook the onions 5-6 minutes until the edges brown and the onions become translucent. Season with salt and pepper. Pour in the 2 bottles of beer and bring to a simmer. Again, get up any chunks off the bottom of the pan with your wooden spoon. Add the cooked meat, potatoes, carrots, celery, tomato paste, beef broth, water and spices. Mix gently to combine. Bring to a boil then reduce heat to a simmer and cook for about 60 minutes. 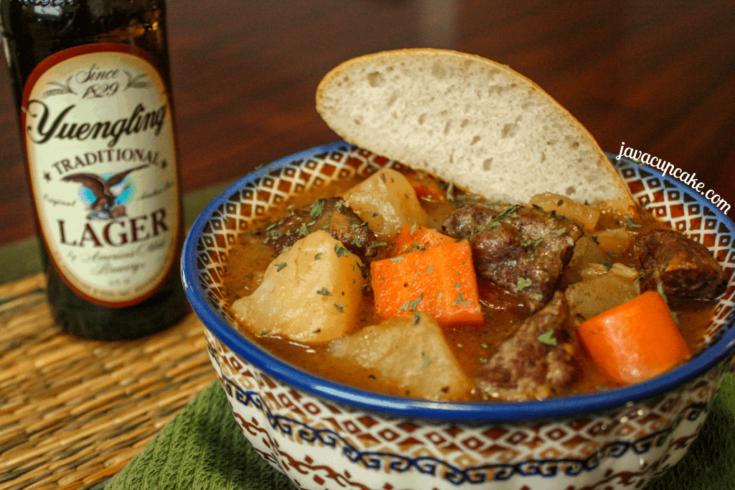 Mix 1/4 cup flour and 1/2 bottle of Yuengling beer together and add to the stew. Continue to simmer until thickens, about 30 minutes. Serve with crusty bread and a Yuengling! Do you add the meat in step 7? Made this , we did add meat in step 7 it was delicious. OH MY GOODNESS! I made this tonight and it was AWESOME!!!! I then posted the link to it on my FB page so everyone I know is directed here to your site! THANK YOU!!!!! This got huge raves from my whole family, my kids included!!!! Yay! 🙂 So glad you loved it! It’s a family favorite for us too! I love adding beer to stew! So delicious. My parents live in TN and always have Yeungling on hand..love that you added it to a hearty stew!